Kiyoshi Momose ’00MS shares his experience as the strength and conditioning coach for the Boston Red Sox. UCF alumnus Kiyoshi Momose (left center) is the strength and conditioning coach for Red Sox players like Eduardo Nunez (far left), J.D. Martinez (right center) and Mookie Betts (far right). When Chris Sale pitched the final out of this year’s World Series in Dodger Stadium in Los Angeles, the first person Kiyoshi Momose ’00MS hugged in the Red Sox dugout was fellow Boston strength and conditioning coach Mike Roose. Then came the hugs for the medical staff. Then the coaching staff. And then, in a blur, he was on the field. It’s been four weeks since the Red Sox won their ninth World Series title, and the realization is finally starting to hit the UCF sports and exercise science alumnus. “From the beginning of spring training, as a team we talked about where we needed to finish this season. It was in players’ minds, coaches’ minds and medical staff’s minds all the time. 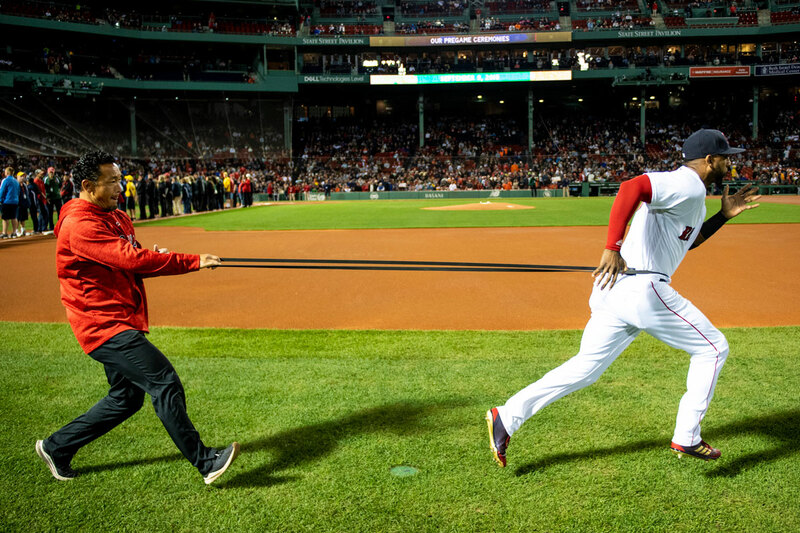 We believed we were going to do it, but it took me a while for it to sink in and understand really what we did,” says Momose, who joined Boston’s staff in 2015 and has served nearly 20 years in Major League Baseball as a strength and conditioning coach. Momose found his way to UCF through his cousin, who was attending the university at the time. A native of Nagano, Japan, Momose was a catcher for the baseball team at Nippon Sports Science University but says an injury cut his career short. He stayed with the team as a student coach and grew an interest in strength training. When he arrived at UCF in 1998, he says his goal was to complete his degree within two years, get certified in the field and then return to Japan, thinking a career in the MLB was a longshot. It would take a steadfast work ethic and determination to complete his goal — he struggled to speak and understand English, so he recorded all of his lectures and listened to them at least twice so he could fully comprehend the lessons. He landed a graduate assistant position in the UCF Athletics Department, where he met Matt Krause ’99, who was a strength and conditioning coach for the Knights and took on Momose as his mentee. He credits his relationship with Krause — who is now the strength and conditioning coach for the New York Yankees — as the reason he’s in the MLB today. The two keep in touch frequently to this day. In the days that followed the Red Sox’s title, Boston held a parade for its beloved champions. Momose says he was overwhelmed by the number of people who lined the streets. “It was just amazing,” he says. Despite being just a month removed from the season, Momose says he’s way behind on work for next year. He has offseason workout plans to make for the players. He doesn’t even want to think about spring training, but he knows he must. Kiyoshi Momose joined Boston’s staff in 2015 and has served nearly 20 years in Major League Baseball as a strength and conditioning coach. To help the team cross that off the to-do list, Momose’s work becomes even more important during the offseason. When the team is playing from March through October, it’s easier to keep tabs on the players’ workouts, schedules and nutrition. Game days usually last 12-13 hours for him and include players’ lifting sessions, warmups, conditioning, stretching, whipping up pregame shakes, the game itself and debrief meetings postgame. During the off-season, however, many of the players leave Boston for their homes in warmer places such as Arizona, California or Florida. Momose communicates with them regularly about the work they need to put in to be ready for spring training in February. To ensure that happens, Momose is constantly looking to better himself as a trainer. He says he has always tried to learn from others and observe their methods, and that’s the biggest piece of advice he can give for aspiring strength and conditioning coaches.